Throughout the ages man has been fascinated by shells. From fossil evidence shells are thought to have been present on this planet for at least 400 million years, a much longer period than man himself. Many present day shells bear a striking resemblance to their primitive ancestors. Shells are among the earliest natural objects known to have been collected by man; he learned quickly their value as tools and utensils. Because of their beauty shells were sometimes used (and still are) for personal adornment. Some were widely used as a currency in various parts of the world. In 1895 archaeologists excavating a cave in the Dordogne unearthed the remains of a Cro-Magnon man together with a red helmet shell and several cowries, all of which came from the Indian Ocean. This is not an isolated case; cowries and other rare tropical shells have turned up elsewhere in pre-historic digs around the Mediterranean. Artists found inspiration in their forms and colours as early as the fourteenth century, but the first great work devoted entirely to illustrations of shells was the Historia Conchyliorum by Martin Lister (published 1685-92). This gave impetus to the hobby of shell-collecting, the pursuit of which was a direct result of the great voyages of discovery to the New World and the East Indies. Cabinets of 'Natural Curiosities' were fashionable throughout Europe during the Renaissance, and contained many shells. The first book with coloured plates of shells appeared in 1755. During the nineteenth century shell collections and illustrated books reached a fine art. 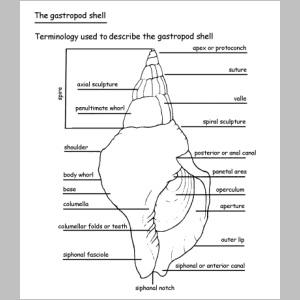 A shell is the term used for the hard, rigid structure enclosing the whole body, or occasionally just some part of the body, of a soft-bodied creature known as a mollusc. During its lifetime the shell protects the animal and supports it, serving the same function as a skeleton; it too is left behind when the animal dies. The molluscs form one of the major groups, or 'phyla', which make up the animal kingdom, totalling something like 100,000 species. About hallf of the Mollusca live in salt water. All rnolluscs have a brain, digestive and reproductive systemns. Nearly all lay eggs and some even look after them. Excepting the bivalves, they have a ribbon-like set of teeth, the radula, which they use like a file to eat. Some are vegetarian, some carnivorous and some scavengers. The cones, augers and turrids kill their prey by injecting poison with a harpoon-shaped barb or tooth. Each class is further subdivided into orders, again according to anatomical differences, though less obvious ones. Members of an order are always grouped into families and then into sub-families. A genus is divided into species, members of a similar species being similar enough to allow interbreeding. The shell is essentially arranged in several layers, of which the outermost is normally the horny periostracum; in some cases this is rubbed away. Beneath this lies the ostracum or prismatic layer, made up of strata of calcium carbonate laid down on an organic framework. Sometimes this is followed by a nacreous layer commonly known as "mother of pearl". The maintenance of the shell is the function of the the mantle; the newest part of the shell is that adjacent to the actively secreting part of the mantle. Larger and thicker shells are usually created by molluscs in warmer rather than cooler climates, due to the absorption and extraction of lime being higher in the former. The shell in a few cephalopods and many gastropods is basically a tube, which lengthens and increases in diameter as the animal grows and simultaneously often assumes a spiral form. The individual coils of the tube are known as whorls and they frequently overlap each other to form a conical spire. The final whorl, usually the largest, is known as the 'body whorl'. The coiling often results in a central pillar known as the Columella which is only partially visible where it forms one side of the aperture. In some gastropods shell growth is spasmodic between rest periods during which no tube lengthening takes place. Instead a thickening of the lip or edge of the aperture occurs, sometimes taking the form of a frill or row of spines. Growth is then resumed, so that a rib is left around the whorl, such projections being referred to as varices. In bivalves the shell is formed in two parts, joined by a ligament and a hinge. Each valve grows outwards from a portion near the hinge known as the umbo, the extreme top of which is referred to as the beak. Most gastropods resemble the snail so familiar in European gardens, which crawls along by a 'rippling' motion of the underside of the foot. The (normally) two pairs of tentacles atop the head serve as touch organs. The eyes are situated either at the tip or the base of these tentacles. The organ most typical of the gastropods however, is the radula, used in feeding. It is ribbon-like and bears many teeth in parallel rows, with which it rasps away the outer layers of its food be it animal or vegetable. The shape of the teeth and their arrangement on the radula are very important in classification. The tube-like organ that bears the radula in some molluscs is termed the proboscis or snout. It can be very elastic and in the case of some of the carnivorous species may be used to inject poison. Another tube-like structure in the marine gastropods is the siphon through which fresh water for breathing is taken into the body. Respiration is by means of gills in aquatic species or by a simple lung in land snails. There is a typical blood system with heart, arteries and veins; the blood is colourless or pale blue. 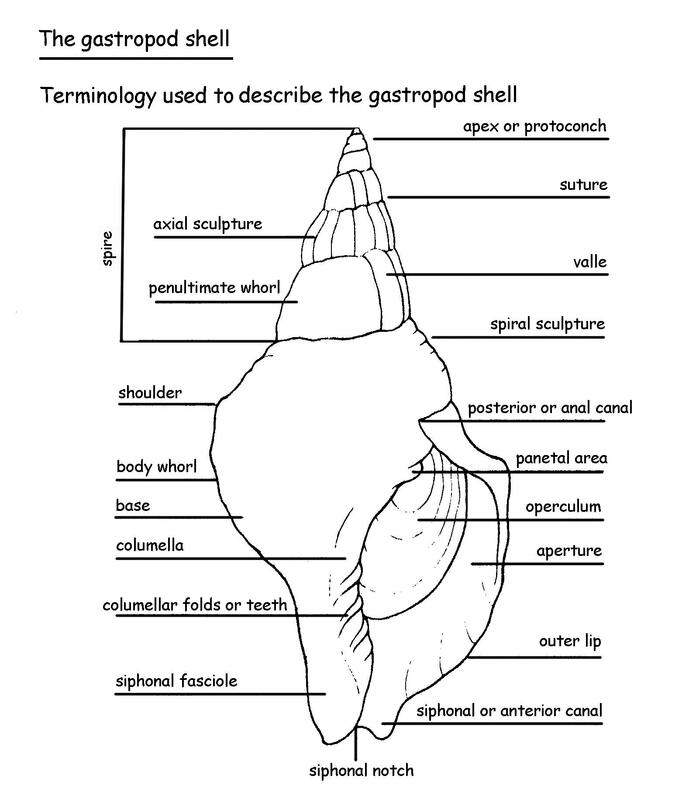 The membraneous layer that lines the shell in molluscs is the mantle, attached to the body near the apex of the shell. The cells at the edge of the mantle secrete pigments and lay down the colour pattern. In the cowries the mantle can emerge from the shell as two flaps, which may completely cover the shell as the animal crawls along, and can be partially or wholly retracted. A powerful muscle enables most gastropods to retreat within their shells at will, or to cling tightly to rocks when disturbed (e.g. the limpet). Many have a 'trap-door' or operculum attached with which they can close the aperture of their shells for protection. This may be solid and heavy, (e.g. Turbinidae and Neritidae) or pliant and horny (e.g. Trochidae and Muricidae). In some of the cones it is small and obsolete. Bivalvia occur both in marine and terrestrial environments. Most are sedentary by habit and as their movements are restricted there is no need for a head with eyes, tentacles or radula. There are two siphons, and feeding is accomplished by drawing water in through one, straining minute food particles and then expelling water through the other siphon. Food particles are swept in by the movement of tiny hairs, or cilla, in the mouth. A few bivalves, such as scallops, and giant clams have numerous eyes set in the side of the mantle. There is a well-developed foot modified for burrowing in sand or mud. Scallops can swim actively for short periods by suddenly opening and closing the valves of the shell.